and…weakened trunk of our boat. and rejoin divisions at once. Hardware, parts of pistols, guns, rockets. when standing in our little yard. We need red, but no dilution. the future is searched in the past. Focusing on sick yellow leaves. shading poisons to new running roots. towards the rise of tomorrow. 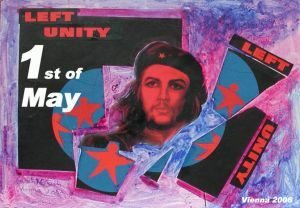 Let us sing left unity. Let us love each other and show vitality. Let us stand glorious overcome deepening lost in nowhere.